The Ulster Farmers’ Union has welcomed the long awaited publication of post-Brexit options for the farming industry in Northern Ireland. However, UFU president Ivor Ferguson has warned that with time short, it is frustrating that it has taken so long to get the document onto the table. He noted that Northern Ireland is the last UK region to put possible framework measures out to industry consultation, but accepts publication has been more difficult here because of the lack of an Executive. The union says it is pleased the document contains many of the ideas put forward by the UFU last year as key principles for a new agriculture policy. These became part of a DAERA/stakeholder document finalised in January and has now been incorporated into this latest document. “We have to make sure that Brexit is an opportunity for farmers here. We need a policy better suited to local conditions than the CAP, which had to accommodate 28 very different member states. Our goal is a productive, sustainable and resilient farming industry, and this document is a good start to securing that,” said Mr Ferguson. The UFU says it is essential the local share of UK farm support remains the same as now, but farmers recognise the delivery model is going to change. It is also underlining the need for a sensible and well-managed transition period to new support structures with the potential to pilot new measures. “Whatever decisions are made, it is vital that we end up with a model that is simple and avoids red tape. It must be targeted at those who take the risks in primary food production. This is an opportunity to create a better system, and it is essential we take this chance to get it right,” said the UFU president. Mr Ferguson underlined that support arrangements that ensure success for farmers and the food industry here were only part of the equation and their ultimate format depended on other crucial issues being resolved. “We need the government to deliver trade deals that don’t undermine our position in the UK market and give us the best possible access to the EU-27 and other markets. 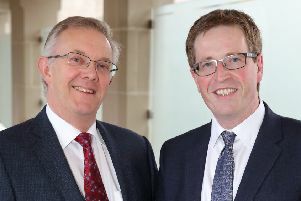 That is essential for Northern Ireland’s outward looking agrifood industry, which has to remain a central part of the local economy,” said the UFU president, adding that the UFU would now consult its members before responding formally to the DAERA consultation. He added that the UFU would work with other stakeholders to ensure farming, the environment and food processing could have a post-Brexit joined up future.